As you may be aware, tomorrow (March 2nd) is Dr. Seuss’s birthday. In honor of this amazing man who has inspired so many, I thought I would do a post about a Dr. Seuss Themed Party. Now this could be made into a kids party, a baby shower, OR it could also work well as an adult party (we’re all kids at heart aren’t we!). Below I have included food, decor, etc. from a variety of different Dr. Seuss books. You can do a party including a variety of stories, or focus on one particular favorite. Shown here, courtesy of ‘Catch My Party’, is a sign in table for a birthday party. However you could do this with a variety of books and just tweek the sign to express whatever works for the party you are throwing. Hostess with the Mostess created an elegant but whimsical Dr. Seuss themed table setting. Love the red and white striped napkins done up as bows. This is a great tutorial from LindO Designs on how to make your own Truffula Trees. 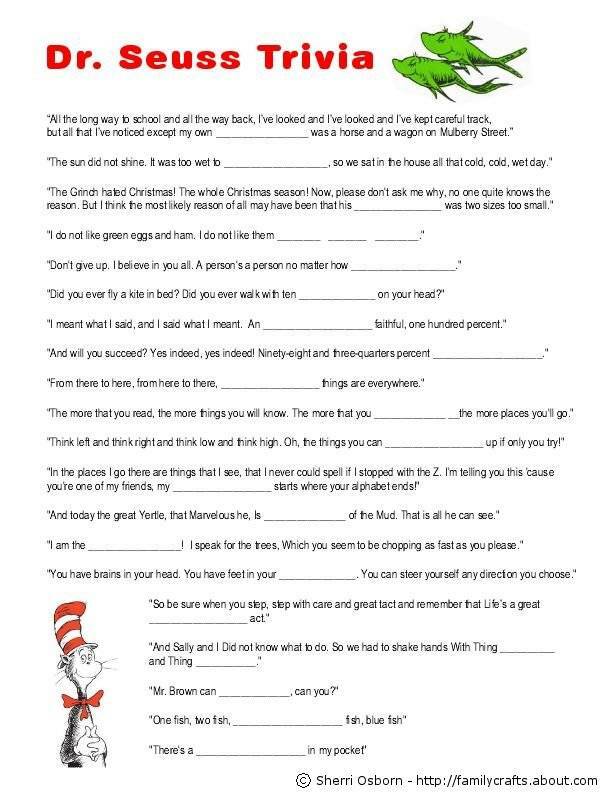 This is a great site (click on the image to be taken there) that has a variety of different characters from Dr. Seuss that you can customize their ‘speech bubble’. This would be great for invitations, name tags, food signs, etc. Love this fun trivia game based on Dr. Seuss books. Unfortunately my pin on pintrest didn’t link to an actual printable but I think this would be a fairly easy document to make yourself. Kate over at ‘And Everything Sweet’ made these adorable cake pops. If you notice, she pulled from three different stories: The Lorax (truffula trees), Green Eggs and Ham, and Cat in The Hat (Thing 1 and Thing 2). These are adorable cupcakes from Emily at Tasty Kitchen. The hats work great for the theme AND look delicious! Make a splash with treats inspired by One Fish Two Fish… blue jello and Swedish fish courtesy of Simple Girl blog. The Sneetches is one of my favorite Dr. Seuss stories. I love what Jill over at ‘Kitchen Fun with My 3 Sons’ came up with as a healthy and fun Sneetch Pear Snack! I love this idea. Found this image on Pintrest but the website it came from no longer exists. 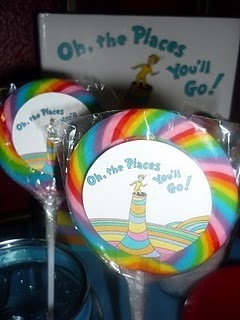 Print the cover image of ‘Oh The Places You’ll Go’ on circular labels and stick to large rainbow lollipops. Great for a party favor! Thanks! And in my opinion…kids are not a necessity for having a Dr. Seuss party 🙂 Some of my favorite theme parties that we have are adult parties for the young at heart!! Thanks Cynthia! And yes…we can all be kids once in awhile! That’s how my husband and I see it… we love throwing adult parties that call back to childhood favorites! fab post! Dr. Suess is one of my favorites- loving all of these ideas! Love the trufula’s and the stripes bows! You’re welcome Jenna! Glad you liked them! Such cute ideas! I love the Hostess with the Mostess table setting! Thanks! And I do too! Hostess with the Mostess always has such great ideas! What a great party theme. I love all of these ideas. Especially the thing 1 and 2 cake pops! Thanks Judy! And he sure does rule!! Saturday will be including my husband and I watching a couple Dr. Seuss stories… tradition that on his birthday we watch a few and feel like kids again! What a great idea and such great touches. So fun! What a great day for a Dr. Seuss party too — I think we need a little whimsy to break all these gray, cloudy days we’ve been having! And those cake pops are so cute! Indeed! It really falls at the perfect time of year when we all need some fun and brightness! What a fun round up, Kenley! Makes me want to throw a Dr. Seuss partay…now! My favorite are the THING 1 & 2 pops. Thanks Lauren! I love those cake pops too! What a fun, cool idea! Everything looks amazing and so creative! Thanks! I really love both of those concepts as well. I’ve actually used the bow tie napkin concept for other parties. OH my, how did I POSSIBLY miss this post of yours? I love the trivia sheet. I should have done that!!!! Thank you so much for the link back!!! 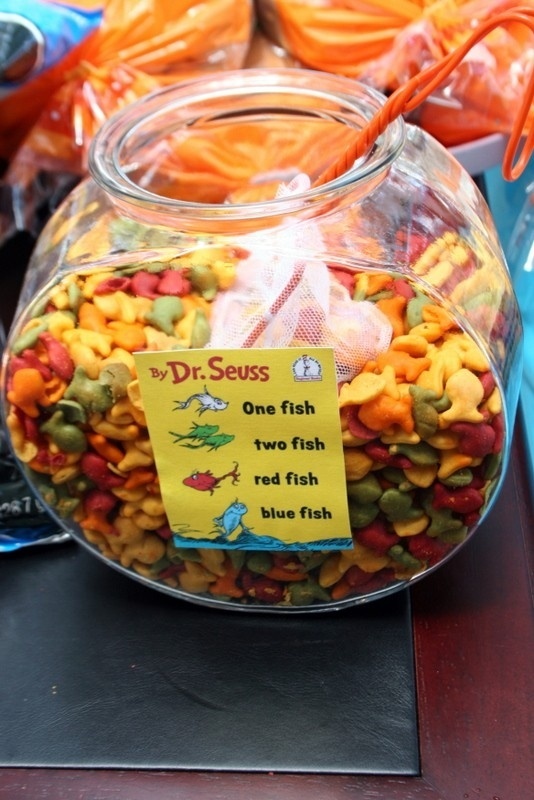 This entry was posted on March 1, 2013 by Jessica Romigh in Entertaining, Kids Parties, Party Planning and tagged bookmarks, Cat in the Hat, Dr Seuss bookmarks, dr seuss books, Dr. Seuss, Dr. Seuss birthday, Entertaining, Green Eggs and Ham, kids birthday party themes, Oh The Places You Will Go, One Fish Two Fish, Party Planning, party themes, Seuss, The Lorax, The Sneetches, this party calls for a theme, truffula trees.